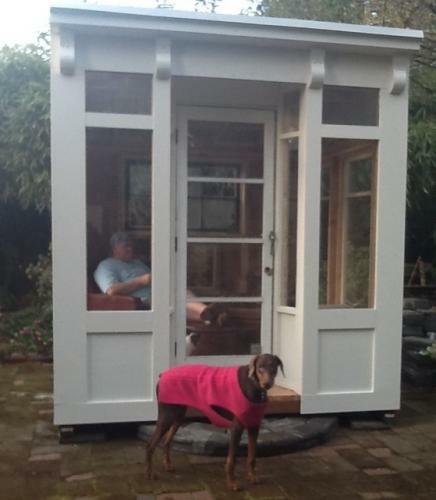 Shaun and his helper arrived on Thursday at 6:30AM and began erecting the back yard shed. 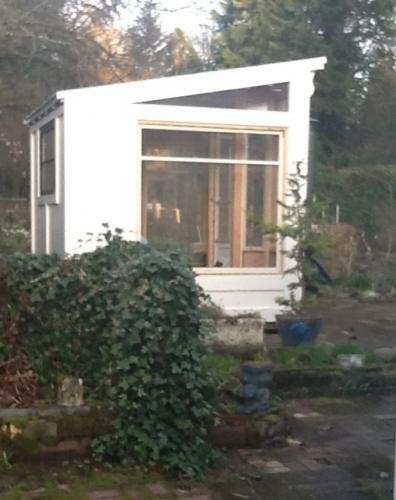 They had the pieces somewhat put together but it took the entire day for them to get the frame, roof and windows installed. They left around 7 PM. Although we have much to do (weather proofing, chalking, insulating, front step and finish work) we are pleased with the basic design and how it fits into our yard. It will be a dry place for the cigar smokers to go. Yes, I have already put a few hardy plants out there. 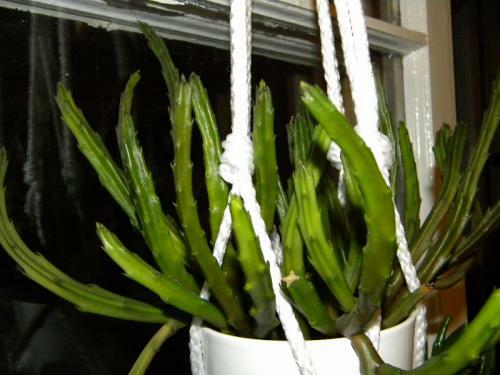 Figure some hardy cactus will look nice in the front windows. Last week I found a good buy on small bonsai planters. Used two, but that was the previous post. Anyway I was left with the third planter. What to get to plant in it??? I stumbled across the most incredible little cactus. "Thank you big box store." 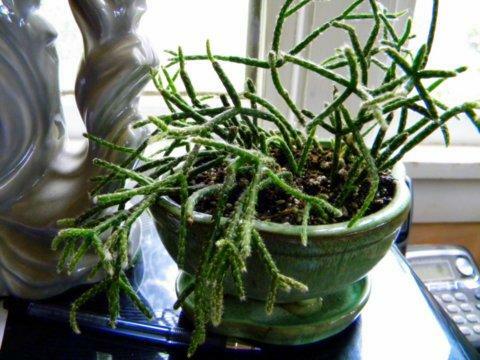 It is called a Mouse Tail Cactus, Rhipsalis baccifera horrida. 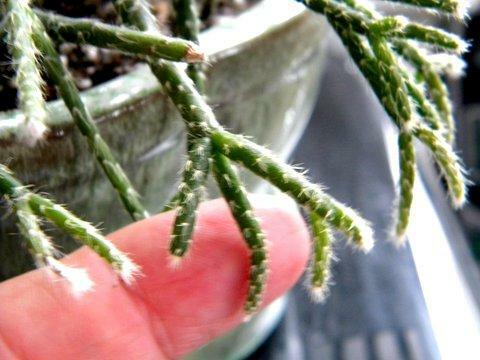 Rhipsalis is a genus of epiphytic cacti. 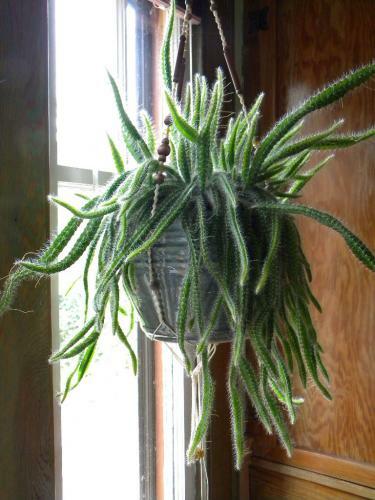 This particular cactus is from South America living in the trees of the rain forest. Tropical warm places in the winter hold my imagination so it had to come home with me. The new little cactus likes more moisture than most cacti and higher humidity. Sounded like a match for my crazed windowsill garden of sunloving succulents. I am hoping that it will stay small. There is obviously a lot of variation in this genus from looking on the Web. I grew another rainforest/tropical cactus and loved it for a while. Then the previous one cactus kept getting too big. *sigh* I hate it when a plant tries to take over my living space. 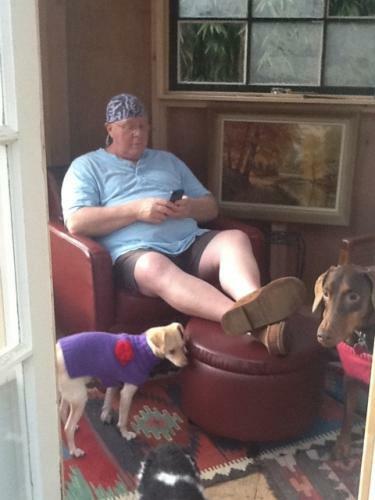 Then they have to be put out for adoption and that is always a very wrenching experience for me. Hopefully unlike the other cactus I grew this new one will stay small. I have two other succulents that are well loved and well behaved. Their size is right and they hang nicely in the living room windows. In February I had found one of my lady slipper orchids had roots that had rotted out. Found out when the plants began to bloom and the blooms faded before opening. Very disappointing. Upon further inspection the bark/soil had decomposed into a compacted substance unfit for the lady slippers. I tossed the remaining plants into a plastic Ziploc bag with some moist bark in the bottom for safe keeping. I had my eye out for a bonsai container for this variety of orchid. Bonsai containers with a wide surface area and multiple holes in the bottom for root to air circulation have worked well for me over the years. 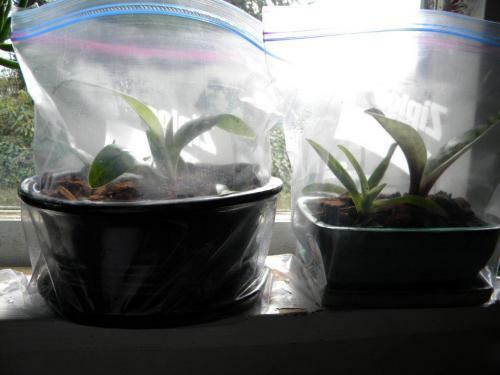 (I gave two away to my son with plants in them so had attempted to use a few other types of containers.) 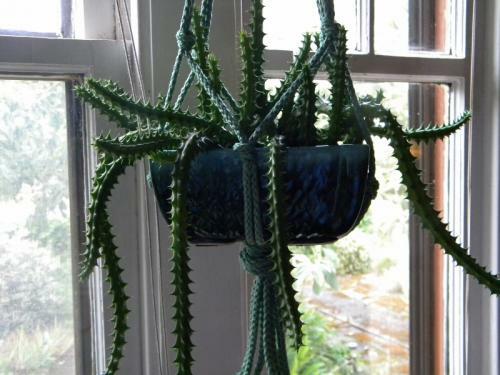 In recent years, one of the criteria for pots in my little house is that they can sit in the window sill or a narrow table top by the window. This really limits the pots I buy. It also limits the size of the plants that I buy (in most cases :)). The bonsai pots have provided a great environment for the lady slipper orchid. The plants had been successfully blooming several times a year. Unfortunately these containers can be expensive, so until last week had not found anything I liked in the price point I was willing to pay. Then I struck pay dirt! Five dollars apiece in a few designs I liked. I got three. Two went into immediate use. One plant has developed a nice thick root and the others have root buds developing. The temperatures in the house haven't' been as warm as the plant would prefer, but hopefully roots will develop soon. The plastic bags aren't that attractive. My other lady slipper, a dark blooming variety has a pair of blooms at the moment. It too should probably be repotted. I will wait until after the blooms fade. Then it too will get new bark/soil. 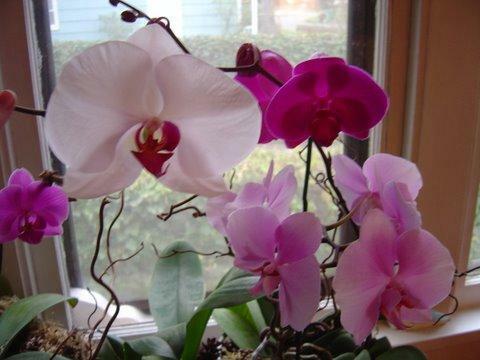 Orchids Fun, Frustrating, Dependable, or Finicky??? Orchids have gotten really cheap, at least the ones on the discount tables of some stores. A nice looking orchid under $5 could be a temptation. I can never pass up a perceived bargain, and have had many an opportunity to try orchids. Some grow/work for me and some have come and gone. Working for me means that they not only have to live, but they have to stay within certain space limitations. My home is only 800 square feet, so....plants have to stay small or move on to larger abodes. I never dreamed that moth orchids (Phalaenopsis or phals) could get so big! I love their thick fleshy leaves and the pink varieties that have flowers last for months. I picked up three phals on one of those "sale" tables. 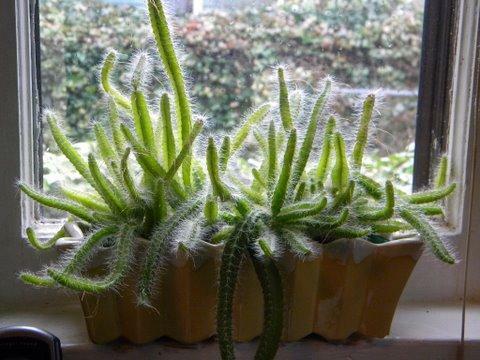 They did well in a south window (its very cloudy in the Pacific Northwest) and once I got their water requirements down (a good dunking and draining out in the bathtub every ten days) they began to flourish. Unfortunately they got a little big when their leaves got over a foot in length and six inches wide. Three plants crammed into my window sill began to keep our beloved sunlight blocked. A charity auction/plant sale was my rescue for finding a new home for them. A very reliable orchid that I have had for years is an Oncidium. Its bulbous base makes it drought tolerant. I have not been successful with all varieties of this species. I quickly killed one with a pretty white flower. I can never tell how well or poorly plants will do. 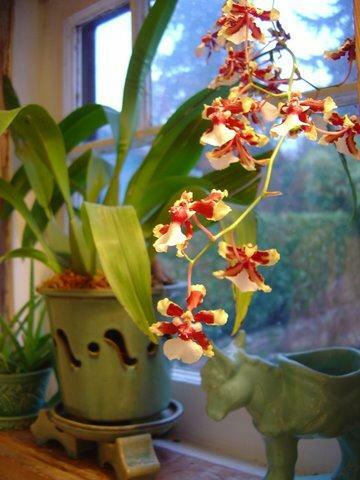 My old Oncidium with yellow and rust blossoms has reliably bloomed in November for 8 years. 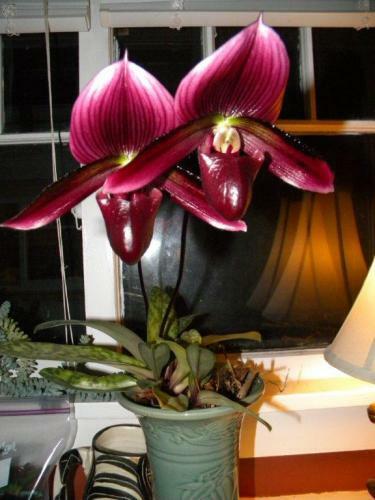 The blooms on this one are short lived compared to the phals lasting only 2-3 weeks once they are open. 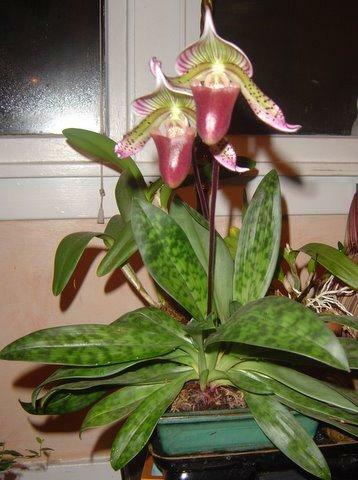 My very favorite is the two varieties of Paphiopedilum, or lady slippers. They grow in more of loose soil versus the wood bark of the other orchids, and I treat them pretty much like I do my other house plants with a scheduled watering once a week on Sundays. They bloom regularly with flowers lasting a good long time and will rebloom on the new starts up to twice a year. I really like their mottled leaves also. The best part is paps are fairly easy to divide if they begin to get too big. For a house plant they have everything that I like in a plant: unusual qualities in the long lasting bloom, interesting foliage, and easy care and they don't get too big. 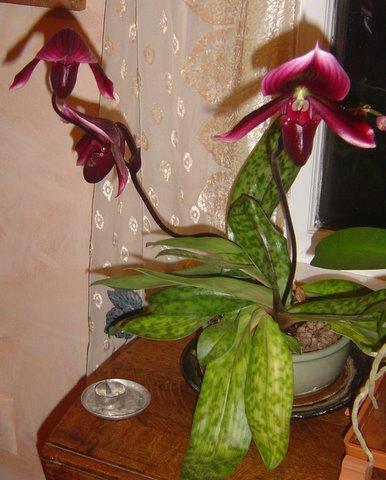 I have a couple of other varieties of orchids that I have had for many years. They are either on the rebound or they are dieing. I am having a hard time telling the direction they are heading. I have definitely had more failures than successes with orchids, but the joys of the blooms lasts so much longer than any cut flowers. For this reason alone I simply have to give it a "try" when I find them on a "sale" table.